The beautiful Tripode G6 Lamp provides a cheerful and stylish atmosphere and is ideal for informal settings. The Tripode comprises three tubular metal rods which are topped off with a classic shade. This extremely stable arrangement obviates the need for a heavy base. The lamp cord is tucked away in one of the legs so as not to detract from the clean lines of the composition. 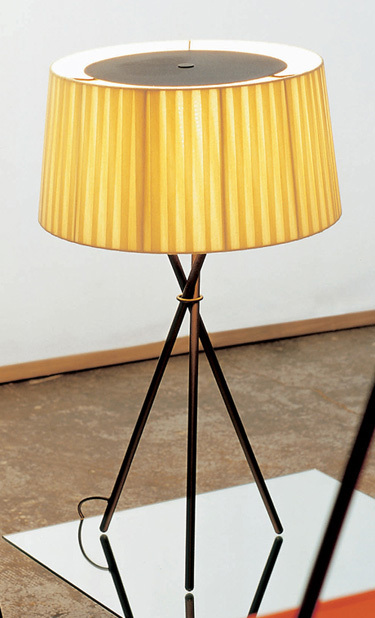 The ribbon lamp shade comes in three colors: red, black and natural (pictured). The shallow conical frame is cleverly covered with three-centimetre wide banded ribbons, woven from threads of the desired colour. This gives the light an intriguing striated effect. The lamp's shade creates a modern and warm environment.